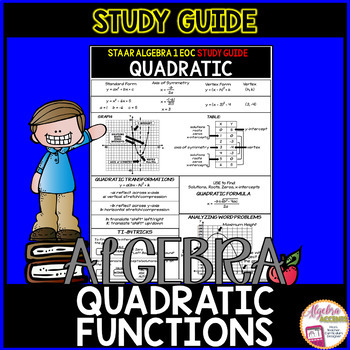 I made this study guide for my Algebra 1 students to review the Quadratic Functions unit as we start preparing for the upcoming STAAR Algebra 1 EOC. 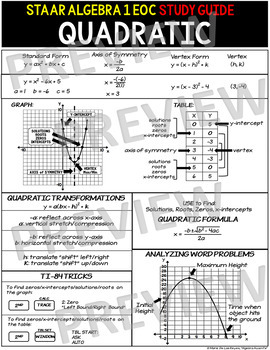 Simplifying, Solving, Functions, Linear, Systems and Exponential STAAR study guides are available HERE. *For non-Texas teachers, the standardized test prep resources above are specifically designed to align with the STAAR Algebra 1 End of Course Exam but can also be used to review for most state Algebra 1 EOC exams as content standards across the U.S. are similar. CLICK HERE to sign up for my newsletter and receive a surprise freebie! © Copyright Marie De Los Reyes, "Algebra Accents." All rights reserved by author. This product is to be used by the original purchaser only. Copying for more than one teacher or classroom, or for an entire department, school, or school system is prohibited. If you are a coach, principal, or district interested in a site license, please contact me for a quote at Marie.DLR@AlgebraAccents.com. This product may not be distributed or displayed digitally for public view, uploaded to school or district websites, distributed via email, or submitted to file sharing sites such as Amazon Inspire. Failure to comply is a copyright infringement and a violation of the Digital Millennium Copyright Act (DMCA). Intended for single classroom and personal use only.